… THIS SEVERED HUMAN TONGUE! 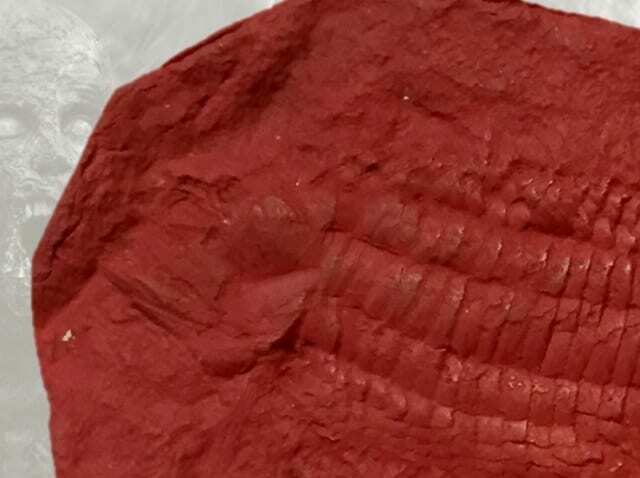 Upon closer inspection, it was actually Australosomus merlei, the star of this October’s underwhelming fossil fish of the month, our monthly foray into the drawers of the Grant Museum’s fossil fish collection to ask ourselves questions like why was this collected? What is it good for? and I’LL SWALLOW YOUR SOUL? According to the Grant Museum database this is Australosomus merlei. Australosomus is an extinct genus of ray-finned fish. Living members of this group are the most dominant vertebrates on the planet by number of species. Think of a living fish that isn’t a shark, skate, ray, coelacanth, lungfish, chimaera, the unseen master of the deep, lamprey or hagfish and it’s a ray-finned fish. Australosomus was a geologically short-lived group, species in this genus are only known from the Triassic period. However, Australosomus fossils have been found in Canada, Greenland, Madagascar and mainland Africa. 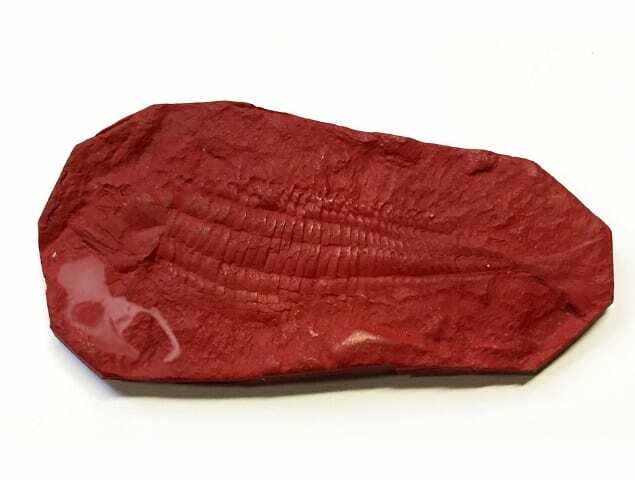 Preservation The keen-eyed amongst you will have spotted that this fish has been fossilised in the hardened blood of a thousand doomed palaeontologists is actually not the real thing (and not for the first time in this series) but a plastic resin cast. This is one of a number of casts of this specimen made with different materials. Why, we do not know? The original specimen from which this was made was collected from Triassic rocks in Madagascar. This cast nicely shows the vertical rows of scales, typical of the genus and unusually for this series, we’ve almost got the whole fish in profile with just a few elements of the head missing (on the original). Close up of LDUCZ-V1698 you can almost work out that the tip of the skull is missing. Scientific Research A cryptic note in the Grant Museum database reads: “References figd. Origin of braincase. Piveteau, Jean. 1934 Clatto Verata Nicto. Annales de Pal., 23, p.10-40″. Jean Piveteau was a French palaeontologist who wrote a number of volumes on the fossil fish of Madagascar, including Australosomus. Piveteau’s work on these exceptionally preserved fossils helped to understand the segmentation of the skull and endocranium in Triassic fish and the evolution in ray-finned fish in general. Piveteau’s work on these fish lead him to propose that living cartilaginous fish such as sharks, skates and rays didn’t represent a primitive condition rather bone had been lost in these groups. Unfortunately, I’ve not been able to find a copy of his 100 page memoir to confirm if the original of this specimen was figured by him or not. In Society As with many of the fossil fish we feature here, Australosomus hasn’t really had that much of an impact on wider society, it’s shaping, history or culture. To fill the void here’s a bit of fan service, a REVERSY PERCY shot of this specimen. Let’s see what’s going on on the flipside! Very little it turns out aside from some jauntily angled label writing which lets face it, for this series that’s almost as exciting as it gets! Mark Carnall is the Collections Manager (Undeath Collections) at the Oxford University Museum of Natural History and former Curator of the Grant Museum. I yet again beg to differ with the viewpoint that the specimen is anywhere near underwhelming. On looking at the reverse view, I see that the specimen is indeed, the long-lost tongue of Red Rum, three-times winner of the Grand National (Second twice) and revered national treasure. However, I have to say that the fishy itself is very pretty. Even more interesting is the concept that sharks, rays et al did a reverse-engineering thingy and became cartilaginous. Most interesting. But not at ALL underwhelming.